What is problematic with returning null? A common pattern, both in the code I am used to work with, and in parts of the .NET Framework, is to return null in methods if for some reason a valid return value is not available. So, why would you consider handling this, and similar cases, differently? My first argument is, returning null makes code hard to use. Let me show you by example. Is there any way for the user to tell, by looking at the method signature, whether he needs to guard for the return value being null or not? No there is not. He will have to check the documentation, or the code (if available). Would it not be better if he could tell directly? You could achieve that by naming the method GetPersonByNameOrNullIfNotFound but that is not very desirable. This makes the code much harder to read. Here the Person class implements a static property, Nobody, that returns the null object version of Person. There are a couple of advantages of using this pattern over returning null. Users do not need to add null checks in the calling code, making it simpler. The risk of NullReferenceException being thrown is eliminated. The last point here is interesting. If you, when implementing this pattern, realize that need to check the returned value anyway. Then this pattern is not suitable for your situation and you should consider a different solution. If you analyze your code and come to the conclusion that the case where null is returned is an exceptional case and really indicates an error condition, you can choose to throw an exception instead of returning null. One example of this is the File class in the .NET framework. Calling File.Open with an invalid path throws an exception (different exceptions depending on the type of error, for example FileNotFoundException if the file does not exist). A system that fails directly when an error condition is detected is called a Fail-fast system (wikipedia link). I have worked in a large project where this philosophy was applied. Actually we didn’t throw exceptions, we directly halted the entire system, dumped all memory, stack and logs and reported the error. The result was that once the system went live it was really robust (having multiple levels of testing, some that ran for days or weeks simulating real load, also helped a lot). Failing fast might not be suitable in all situations. Assume for example that you are dependent on data from an external system, or user. If that system provides invalid data you do not want your system to fail. However, in situations where you are in control I recommend failing fast. This idea can be expanded to test a lot of different preconditions and if they are fulfilled, do the operations. Even though the test passes, the accessing method might fail. For example, in a multi threaded system the resource may have been deleted by another thread between the test and the accessing method. Requires the caller to remember to do both calls and not just call the accessing method. Same as tester-doer, with the addition that you only need one call, hence the thread safety issue is taken care of. Obscure method signature where the return value is not the data you requested, instead an out variable is needed. This post have hopefully provided you with some alternatives to returning null and some ideas on why and when it can be good to do so. As always, most important is that you try to make the code as clear and simple as possible. Now, code! Why is debugging Blazor applications different from Angular or React? But if the built in developer tools does not support Blazor, what to use? At this time there is only very early support for debugging client-side Blazor applications. And the only browser where debugging is supported is in Chrome. The reason only Chrome is supported at this time is because Blazor provides a debugging proxy that implements the Chrome DevTools Protocol. This allows the DevTools in Chrome to talk to the proxy, which in turn connects to your running Blazor application. In order for the proxy to be able to connect to the running application, remote debugging must be enabled in Chrome. It’s a bit cumbersome, but I will go through the steps required in detail below. Hopefully the Blazor team will focus on improving the debugging support since it is a very important ingredient if Blazor is to be popular among developers. Follow these steps and you will have a debugging session up and running in no time. I will assume you have Chrome installed and a working Blazor application that you wish to debug. 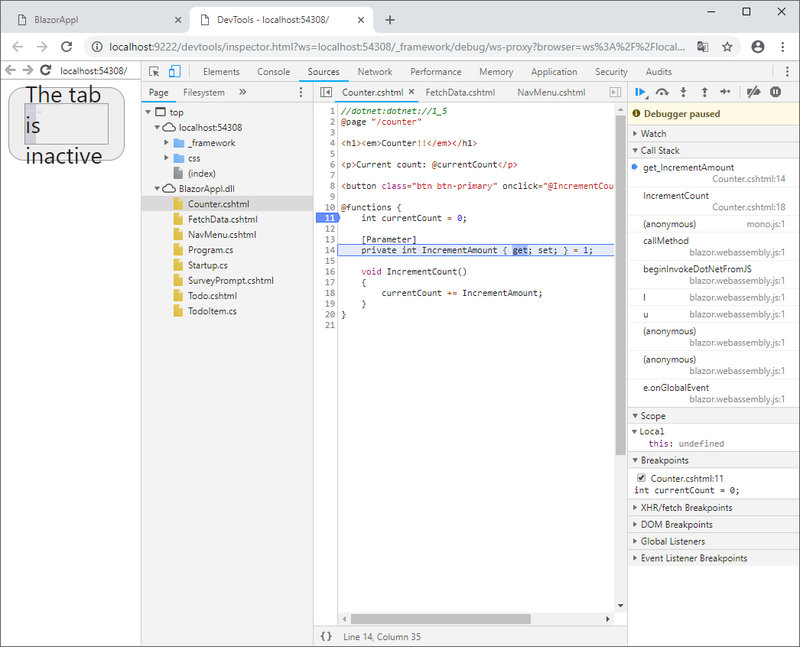 As you understand by now there is still a lot of work to do in order to get full debugging support with Blazor, but the fact that there are some debugging support in place is promising. It is a bit cumbersome to start a debug session, but it is not hard. I have worked in really large projects with custom build tools without a working debugger and it is not a good spot to be in. However, with Blazor I have good hopes that the development team understands the importance of a good debugger. A couple of blog posts ago I wrote about how to design a REST API with ASP.NET Core and now I intend to show how to create a front end that can interface this service in order to create and remove products from the repository. I will create an application, using Blazor, that can be used to list all products, create a new product, and delete an existing product. Start by creating a new Blazor application. If you’ve never done this before there are some components that you need to install, follow the instruction on https://blazor.net/docs/get-started.html for details on how to do this. which will create a new Blazor project named ProductsManager. You should now be able to open your web browser and see you Blazor application in action. Notice the Fetch data link. Clicking this loads the FetchData component which we now will modify to fetch data via our REST API. Open the ProductsManager project file in Visual Studio. A solution will be created automatically for you. In the Pages folder you will find the FetchData component. If you open the source file (FetchData.cshtml) and scroll to the bottom you will find a call to HttpClient.GetJsonAsync that currently just reads a sample file located in wwwroot/sample-data. "Description":  "Chess player's secret weapon"
"Description": "Control the weather with a simple click of a button. Requires two AA batteries (not included)"
Now, if everything works as expected you should be able to see the product listing from the sample file instead of the Weather Forecast when you click the Fetch Data link in your browser. I hope you found this at least a bit helpful. If anything is unclear just add a comment. And If you want me to publish the code on GitHub just let me know and I will do that as well. Unit testing code that reads or writes to the filesystem can be difficult. One thing that can help is an in-memory file system that lets you emulate the actual file system just for testing purposes. This morning I stumbled across a blog post by Jason Roberts, a five time Microsoft MVP, freelance developer, writer, and Pluralsight course author, where he describes how to use System.IO.Abstractions and System.IO.Abstractions.TestingHelpers (available through Nuget) to set up an in-memory file system that you can use when you want to unit test your file system dependent classes. That is a very technical description, most likely formulated by a software engineer. I will make an attempt to describe Blazor and WebAssembly in my own words. 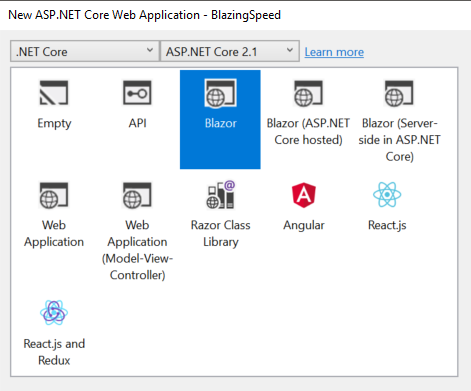 Part of the Blazor project is to create a .NET Runtime in the Wasm format that runs in the browser and executes .NET bytecode. Why Blazor over AngularJS or React? 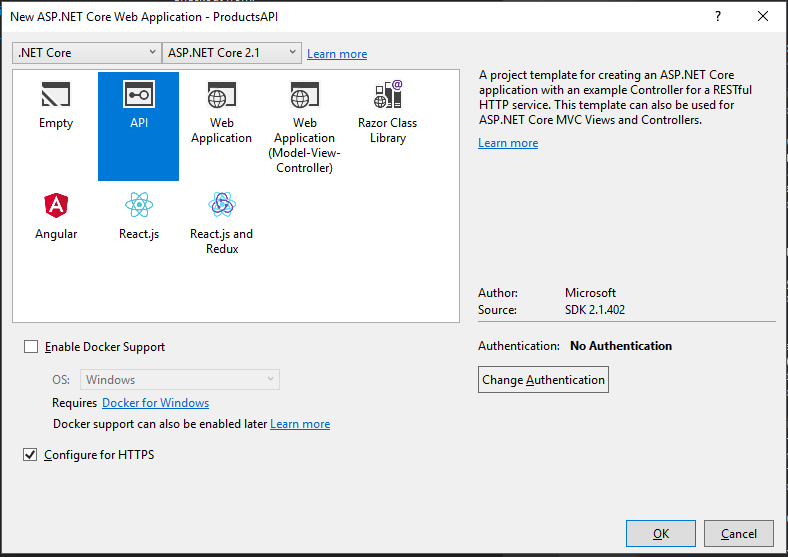 Then there are a bunch of other things that makes it appealing to run .NET in the browser, like great development tools, well known APIs and stable build tools. How is it to develop with Blazor right now? When you create your web application with Blazor you create components which are HTML and C# code that you can either choose to display separately or as part of other components. The concept is easy to grasp and if you are comfortable working with HTML and C# you should be able to understand what’s going on in the code right away. If you are a C# developer interested in web development I highly recommend that you give Blazor a try. My guess is that it will become one of the major web frameworks for creating Single Page Applications (SPA). 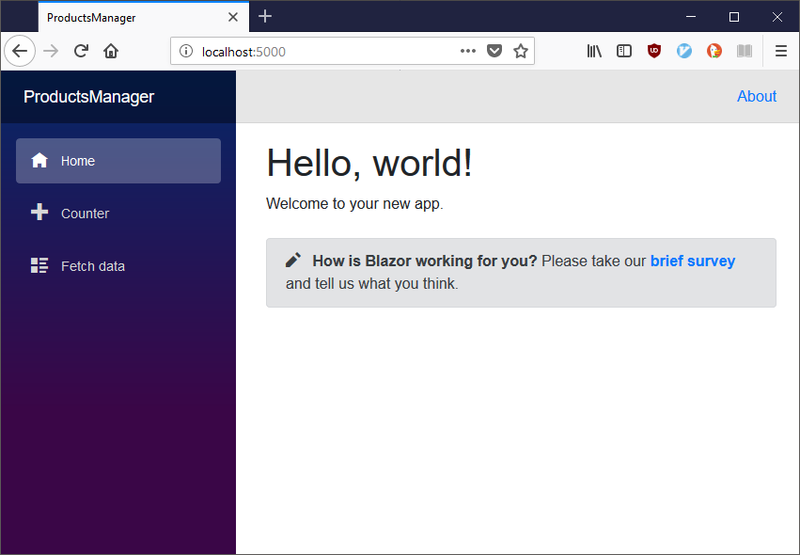 Visit the official Blazor web site at https://blazor.net where you will find instructions on how to get started as well as a tutorial that will guide you through the basic concepts. You may also want to visit the official WebAssembly homepage at https://webassembly.org to learn more about Wasm. REST is short for Representational State Transfer, and is way to design web services. So called RESTful web services. Usually the RESTful service is accessible via a URI and HTTP operations such as GET, POST, PUT, and DELETE are used to get or modify the data that is often stored in a database behind the web service. Note that it does not matter whether the client that will be using the API is a mobile app, a desktop app, a web app, or something else. I am using Visual Studio 2017, Version 15.8.5 and .NET Core 2.1. If you use different versions, things may work a little different. 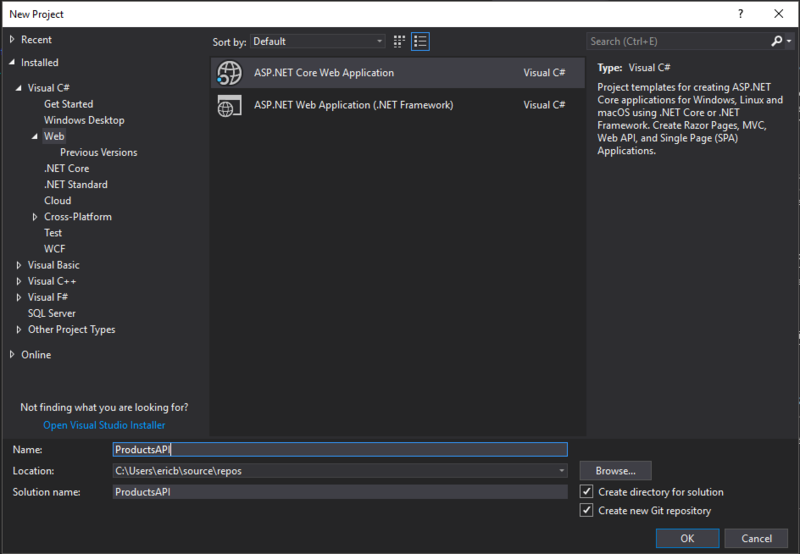 Start by selecting File -> New -> Project and in the ”New Project” dialog box choose Visual C# -> Web -> ASP.NET Core Web Application. Name the project ”ProductsAPI” and click OK. In the next dialog that pops up, select ’API’ and click OK. When you use this template, code will be generated that sets up some basic configuration and adds a dummy controller so that you can build and run the application. If you press ’Ctrl + F5’ the application should start and open up a new browser tab displaying ”value1” and ”value2” formatted as JSON. I created a Models folder on project level and added the Product class there. Since we are using ASP.NET I want to take advantage of Entity Framework when working with the database. Entity Framework is an Object-Relational Mapper (O/RM) which let’s you work with domain specific objects and don’t have to worry so much about how to interface with the database. The Entity Framework types that we will be using are the DbContext and the DbSet. The DbContext represents the connection to the database and one or more tables. The tables are represented by DbSets. The code above informs us that we expect to have a database containing a table of Products. The constructor argument is of type DbContextOptions and will contain configuration options for the database connection. In order to make it easy to be able to query and update the database I will register the ProductContext with the Dependency Injection container which is a built in component of ASP.NET Core. Doing that will make it possible to automatically instantiate objects that takes a ProductContext as a constructor parameter. I will use that later on when designing the ProductsController. This single line registers the ProductContext as a service in the Dependency Injection service collection and specifies an in memory database, named ProductList to be injected into the service container. Not bad for a single line of code, don’t you think? So far we have only created scaffolding, but no implementation to actually handle any HTTP requests. Now it’s time to change that. Looking back at the API definition we expect that a user should be able to list all the products in the database by a GET request using the URI /products. The most straightforward way to accomplish this is to add a ProductsController, that takes a ProductContext in it’s constructor, and then add a Get action that returns the list of products. Description = "Classic American car." 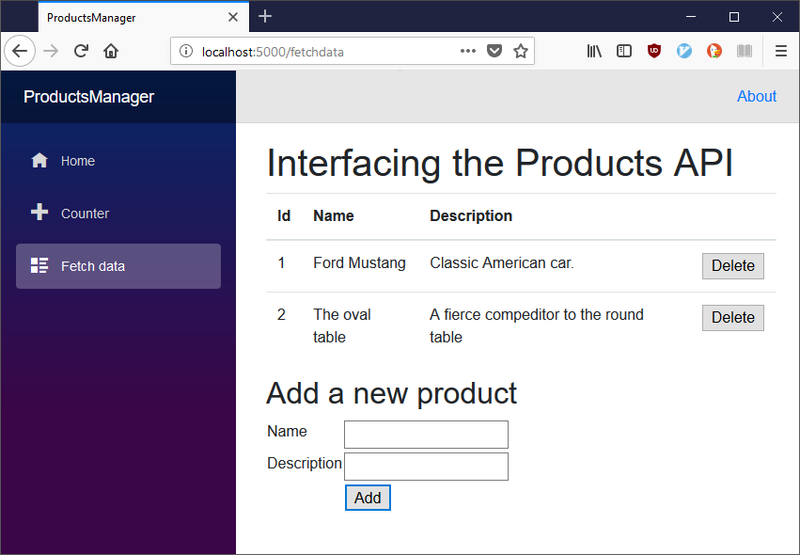 As you can see, I add a new Product, a Ford Mustang, in the case that the database is empty. This is just so that we can see that it works as expected. Take some time to look through the code, it should hopefully be quite straight forward to figure out how it works. If you want me to add a working example on GitHub, let me know in the comments. I you want to test the API during development I recommend a tool like Postman. It is a good tool for sending HTTP requests and checking the responses. To be a bit formal, a priority queue is an abstract data type (ADT), similar to a regular queue, but where each element has a priority associated to it. An element with high priority is served before an element with a low priority. Elements which have the same priority are usually served in the order they were added, but that is not a formal requirement. In other words, it’s like the queue to the fancy club down town, where all we regular people have to stay in line outside and the VIPs just walks right in. This should work, and it’s a descent solution. However, sorting the List<T> like this every time an element is enqueued is not the optimal solution. We can do it better. Now we have to dive into the realms of Computer Science. If concepts like Big O notation and Binary Heaps just are strange words that you don’t know what they mean I recommend reading up on those first and then returning here. You can find an introduction to Big O notation here and a good explanation of Binary Min and Max Heaps here. All ready to go? Great! So, using the solution above we get an O(nlogn) dependency when Enqueuing elements, that is due to the sort that occurs after each addition. However, if we order the data in the List<T> as a Binary Min Heap both the Enqueue and Dequeue operations can be improved to O(logn) which scales much better. There you have it! A fully working Priority Queue implementation in C# that scales. Threading and concurrency is a big topic and there are plenty of resources out there that covers the hows and whats related to starting new threads and avoiding locking up your UI and so on. I will not go into those details but rather try to focus on things that are good to know, but aren’t covered in the normal threading howtos you find online. When is it worth starting a thread? The best thread is the one you don’t need. However, a rule of thumb is that operations that might take longer than 50 ms to complete are candidates to run on a separate thread. The reason for that is that there is overhead involved in creating and switching between threads. Also, remember that for I/O bound operations there are often asynchronous methods you can use instead of spawning a thread on your own. What is the difference between a background and a foreground thread? The main thread and any thread you create a using System.Threading.Thread is by default a foreground thread. Any task you put on the System.Threading.ThreadPool is run on a background thread. There is only one thing that differs between a background and a foreground thread. That is that foreground threads will block the application from exiting until they have completed, but background threads will be abruptly aborted when the application exits. Note: This means that any clean-up actions you have defined, such as removing temporary files, will not be run if they are supposed to happen on a background thread that gets interrupted by the application being shut down. You can however use the Thread.Join method to avoid this problem. It is also possible to set a new thread to run as background thread if you wish to avoid that it may block application exit. This is a good idea for long running threads that otherwise can lock up the application. Most of us have probably experienced applications becoming unresponsive and the only way to shut them down is via the task manager. This is often caused by hanged foreground threads. Also note that all Task-based operations, such as Task.Run, but also await-ed methods, are run on the thread pool, and hence on background threads. How to catch exceptions on threads? Will the NullReferenceException thrown from MyDelegate be caught? Unfortunately no. Instead the program will terminate due to an unhandled exception. // Exception handling code. Typically including error logging. Notice how the value 5 is written twice and 0 and 8 is missing, and we actually got the number 10 written. Why does this happen? The answer is that the variable i refers to the same memory during the entire lifetime of the loop. Inside the loop we start 10 different threads that all reads the same memory address when it is about to write the value of i. However, i is updated on the main thread which runs independently of the other 10. This time the numbers 0 to 9 will written without duplicates or missing numbers, the order is still not deterministic though. This is because the line var temp = i creates a new variable for each iteration and copies the current value of i to that location. Each thread will therefore refer to a separate memory location. The threads are however not guaranteed to run in the order they are started. There are lots of things to keep in mind when working with threads. I have touched on some things in this post that I think can be tricky. As usual I recommend having a good book near by that you can use to look up things when they don’t work as you expect. Just by reading the heading of this blog post won’t tell you anything about what kind of book I am writing a review on. The full title is actually The imposter’s Handbook – A CS Primer For Self-Taught Programmers, where CS is short for Computer Science. The book is written by Rob Conery, a self-taught programmer without a CS degree. In 2014 Rob spent a year studying Computer Science fundamentals and wrote about the things he learned, which resulted in this book. When I heard the book being discussed on the Coding Blocks podcast I got interested and decided to order a copy of it for myself. Just like Rob I am (mostly) self-taught when it comes to Computer Science subjects. I do have a master’s degree, but in electrical engineering, so none of the courses I took on the University covered the subjects that Rob writes about. The book touches on many areas, and does not deep dive into any of them, so it is probably wrong to say that any of the subjects are ”covered”. However, the author introduces each subject and gives you enough understanding about them to cover the basics. And if you want to deep dive into anyone there are a lot of books out there that do cover the details. As you understand, with these many subjects, you cannot dive into details and still have everything in a single book. I would say that I depends. For me personally I enjoyed reading the first chapters, but from Big O and forward I pretty much already knew the things that the book brings up. However, I recognize that I am not the typical self-taught programmer. I read, a lot, of books on programming, I have taken Coursera courses on algorithms, and I do programming challenges on Codewars, Hackerrank, and Codility just for the fun of it, I listen to several programming podcasts, and subscribe to several programming newsletters. But if you look at the subjects listing above and feel that you don’t have a basic understanding on these subjects, this book is most certainly quite useful. I have the printed version of the book, and it is obvious that the source needs to be looked over to avoid having pages where the last line on the page is a heading, and similar formatting errors. I found many of the code samples to be questionable in regards of code structure, naming of variables, etc. I expected the book to contain code samples that clearly showed the expected functionality. When I read a technical book I expect it have been proof read and reworked a couple of times. This book often feel more like an early draft than the finished book. Taking the above into account I give this book a score of: 3/5. It can definitely be good to get a brief understand on some important CS subjects, but if you want to learn any of the subjects really well, I recommend complementing with some books from a well known publisher. C# struct and class – when to use each? In C# you have both Value types and Reference types. There are some fundamental differences between them that are important to understand. The most common value types are the simple ones, like int, bool, char, and long. But also enum and struct are value types. They are called value types due to the fact that variables that are based on any of those types directly contain the values. The second group are Reference types. Variables based on these do not contain the values directly, instead they contain a reference to the where the objects can be found. Common Reference types are classes, delegates, interfaces, and strings. With Value types, when you assign an existing variable to a new variable the actual value gets copied. With Reference types, a new reference to the existing object is created. Value types lives on the stack. They seize to exist as soon as they go out of scope. Reference types lives on the heap. They seize to exist when they are collected by the Garbage Collector. Value types are not polymorphic, what you see is what you have. Reference types can be polymorphic. If MyObject is changed from a class to a struct the object returned from CreateGreen will no longer have the green properties set. Why? Because no longer is a reference to the object sent to SetGreenProperties. Instead a new copy, only local to the called method, is created. Note however that the code will still compile and run, but the application now contains a bug that might be hard to track down. Structs also cannot be polymorphic, in other words you cannot define a generic base struct that other structs inherit. However, both classes and structs can implement interfaces. When to use a struct over a class? It might seem that a struct is just a class with limitations. So why should you bother with structs? Why not just use class only? The, maybe not so convincing answer, is that you should use classes to define the behavior of your application and structures for storing the data that your application manipulates. Structs are Value types, they are suited for storing values. I will elaborate on this idea a bit more to build my case. Structs will come to their best use if you make them immutable. This can be done by setting all the values in the constructor and only supplying read only properties. Once all fields have been assigned you can be sure the struct as a whole is valid. There is no way to alter individual fields, leaving the struct in an invalid state. If you want to update the address you simply create a new Address with the updated information and replace the old one. If you know a bit on how value types are handled you might be concerned that there is a lot of unnecessary copying of values going on when you pass around structs instead of just references to objects. It is true that value types get copied when you pass them to other methods, and that is why you should keep your structs quite small. The copy operations are very efficient for value types and creating a reference type instead would involve overhead for book keeping and garbage collection. It is important to understand that when you assign a struct variable to another, each field gets copied, and this may not be an atomic operation. In a multi threaded system where you have a class or a static variable holding a struct and it is accessed and updated by different threads, you will need to add locks around the read and assignment operations. Even though the struct itself is immutable. // Somewhat thread safe, depending on usage. An even better alternative might be to avoid adding locks in the Person class and instead add locks in the code using it. Part of being immutable is also securing that your struct does not have properties that return references to mutable types. values = 4; // Modifies the internals of the 'unsecure' object. You can remedy this by using ImmutableArray<T> or ImmutableList<T> from the System.Collections.Immutable namespace that I have written about in previous posts. values = 4; // Now this does not modify the internals of 'secure'. Now you hopefully have a pretty good understanding for when structs can be a good option, and how to avoid the pitfalls involved. Most of the time you will use classes, but there are some occasions where structs, are a better fit. You should learn to identify those situations and be able to reason about why you choose one over the other. Finally, if in doubt, use a class. Publicerat avEric Bäckhage september 9, 2018 augusti 29, 2018 Publicerat iC#Lämna en kommentar till C# struct and class – when to use each?